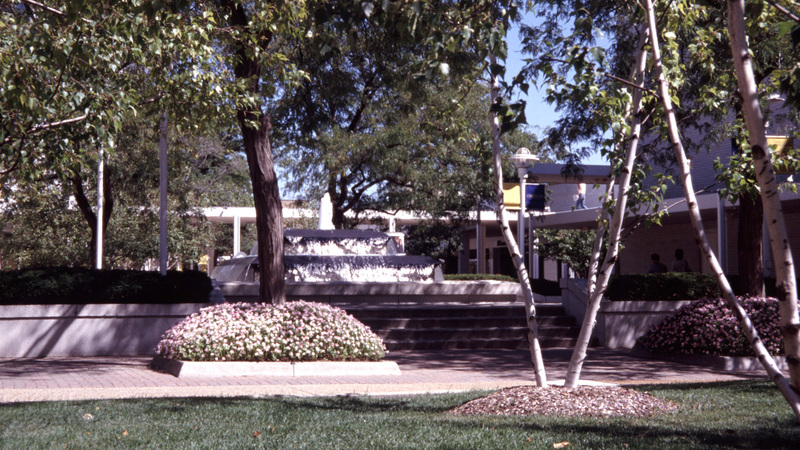 Completed in 1962 in Chicago’s “first-ring” suburb of Oak Brook, this open-air shopping center was designed by the architecture firm Loebl, Schlossmann & Bennett and landscape architect Lawrence Halprin. The land was settled in the 1830s and gradually evolved from a primarily agricultural landscape to one dotted with large estates. In 1898, developer Frank Osgood Butler commenced acquiring farmland for a planned community, although the suburb was not incorporated until 1958. Three years prior to incorporation, Marshall Field & Company acquired a 160-acre parcel of gently rolling, mostly undeveloped land. 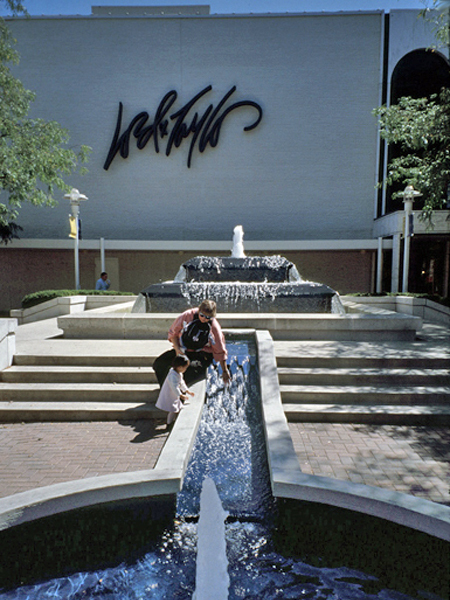 The architects’ design incorporated several multi-level buildings oriented in a saw-tooth pattern to maximize store frontages, with a four-level Marshall Fields and a three-level Sears serving as “anchor stores” for smaller boutiques. 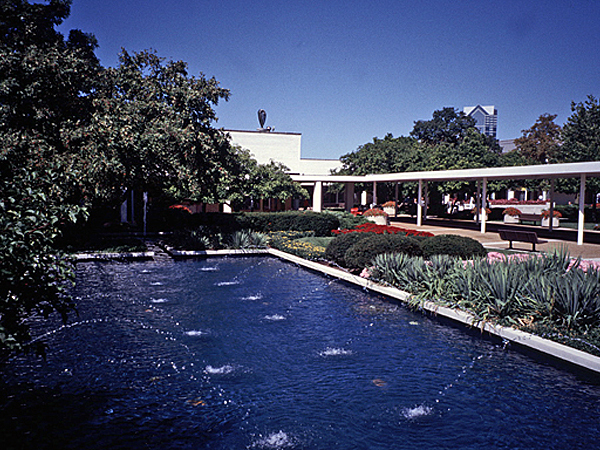 To encourage shoppers to linger, Halprin, Richard Vignolo, and architect Richard Bennett designed an interconnected network of terraces, porticoes, and sunken gardens ornamented with pools, fountains, benches, and custom lighting. 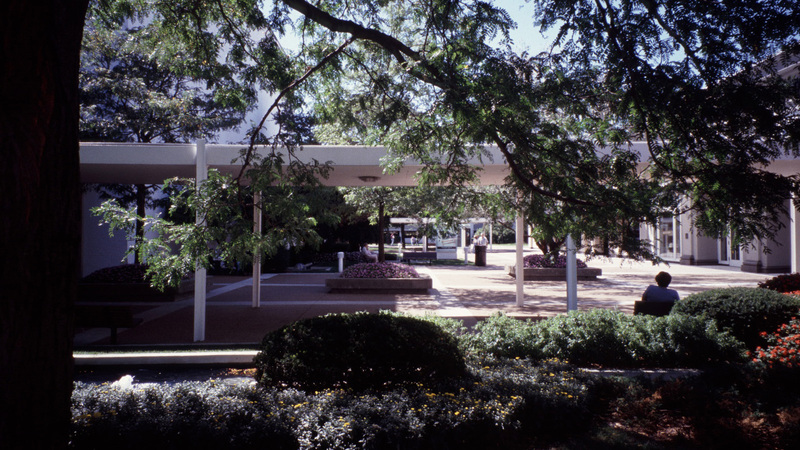 Canopy trees, swaths of lawn, and densely vegetated planters softened the hard lines of the concrete buildings and parking lots. In 1964, a movie theater was added and, in 1973, a three-story Lord & Taylor anchored the southwest corner of the shopping center. 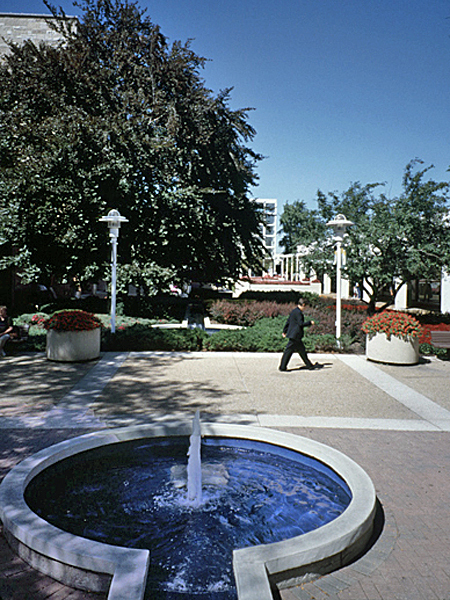 Expansions in the 1980s included the construction of additional buildings, which were flanked on the center’s perimeter with parking lots. As in-fill continued, some of the terraces were built upon, although others remained. In 2014, the landscape architecture firm Studio Outside redesigned several of the courtyards, retaining mature trees and updating the fountains, terraces, planters, and paving.